Interests:Long range competition shooting (FTR). After using Remington 7.5 BR primers for some time, I was unable to source any at the back end of last year. After hearing some good reports of the Muroms and some info from Re-Pete, I made a detour to HPS and bought a significant quantity of KVB-223M primers. I now use them exclusively for both 223 with the 90gn VLD / Varget, and for 155.5gn FB / 200gn Hybrid / RS52. Results for ES and SD for both calibers have been nothing short of outstanding. 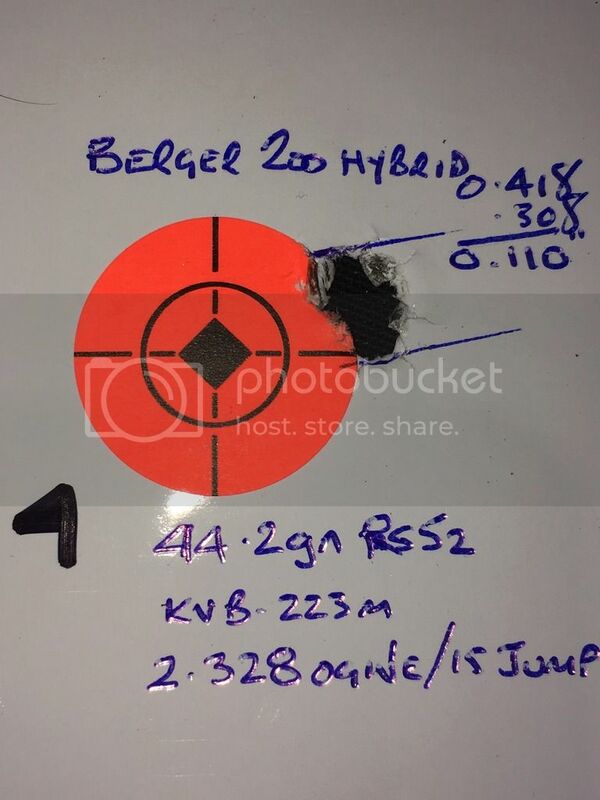 Group below is 5 shots at 100yds, the Murom/RS52 combo produced nice round groups over a variety of charge weights - usual caveat, my load may not be safe in your rifle, especially as I have a lot of freebore. The chamber in that rifle is specifically cut for the 200gn hybrid. Unless I am misreading something here. The thickness of the kvb223 is worrying. I have just tried them and will soon be trying the kvb223M. I have loaded the kvb223 in 308 palma with 155 berger to 48gr RS52 at 3145 fps from my 32 in FTR rifle. This I would call a pretty stiff load!!! I was happy with the precision at the top of the load range and had no primer or pressure issues. Is that primer cup really so thin????? Well, the one I sectioned and measured was..............I had tried the standard KVB-223's in a very long throated 223 with a stiffish loads (80grain SMK at 3080fps ), and had three pierced primers in 40 rounds. This is what prompted my investigation. The action is a Tikka M595, and digging bits of primer anvil out of the bolt was wasting too much trigger time. As soon as the Magnums became available, I switched. I was so impressed I then switched to Lapua Palma brass to use them in 308. In this, with 155 grain Scenars, I've achieved MV's around 3120 with no adverse pressure signs. Very interesting article on the 6mmBR site which has been produced by Laurie - some excellent (hard) work conducted on our behalf. You (and UKV members) are welcome - the nice words are appreciated. (The Gun Pimp deserves a hand-clap as he produces 'Target Shooter' online where the feature actually is. It's a lot of work for him putting it into production - all done for the love of shooting by Vince and the contributors as like this forum, it's a non commercial venture). I've run a second series again with 308 and 168s, but with Palma brass and SR primers. This will be written up in the next few weeks. The SR models produced a lot less performance variance than LR models as well as generally higher standards. Interests:Fclass and Benchrest shooting. Occasionally deer stalking. Reloading for my own rifles. Pest Control and Specialised in Slum cleaning / Trauma and Dirty Needles Removed. Has there been any large rifle testing done? Large Rifle primers? Yes, that's what the link a couple of posts back is to Nick. Great primer test by Laurie and great to see Laurie's work recognised on the other side of the pond. We have a close relationship with Paul McMenamin (of 6BR) and we frequently poach each others articles. Target Shooter will have a stand at the Northern Shooting Show next week and Laurie will be on the stand on Saturday if any UKVers want to stop by and say hello. Yes, come and say Hello, you UKVarminters in the North. I'll be there all day Saturday. Have you tried the higher node, around 46.5 gr?